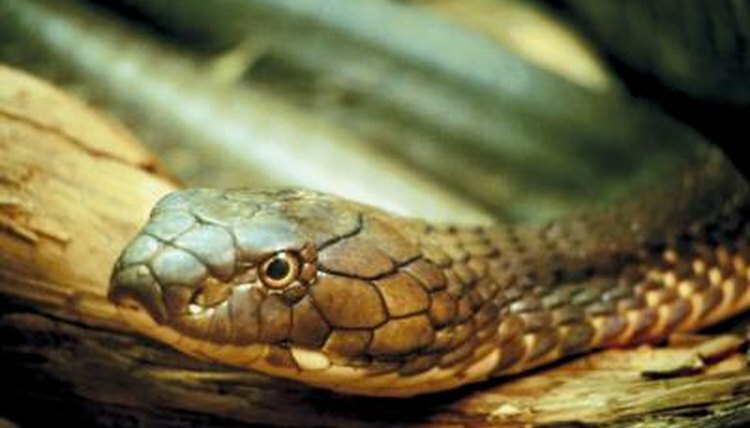 Although some cobra species can spit venom, king cobras are not among them. However, they're still highly venomous. Measuring between 10 and 15 feet long, king cobras are the largest venomous snakes in the world. They live in parts of India, China and Southeast Asia. As king cobras can't spit their venom, they tend to deliver it in a more conventional manner: injection. They raise around a third of their body up to 5 feet off the ground and then quickly strike their prey. They have two short, sharp fangs on their top jaw, which are actually hollow tube teeth through which they inject venom into their target once they've struck. The venom works extremely quickly and soon paralyzes their prey, which they then eat whole. King cobras' venom is less powerful than that of other cobras. However, they can inject two-tenths of a fluid ounce in a single bite -- enough to kill 20 adult humans -- so they're still one of the world's deadliest snakes. Their venom is a neurotoxin, which means it affects the respiratory center of the brain. Death from king cobra venom would be caused by a combination of heart failure and respiratory arrest. Cobras who spit venom are thought to do so as a form of defense. Although they can spit very accurately, often spitting directly in their target's eye, their venom isn't deadly when administered this way. It causes tissue damage and, at worst, can result in blindness. They usually only spit as a defensive warning, at humans or other animals larger than they are, and still bite anything that's intended as prey. Although it's referred to as spitting venom, it's really more like spraying it. Cobras that spit contract their muscles so that they squeeze their venom gland and shoot venom out of holes in their fangs. These holes are rifled, which gives them better aim and allows them to spray venom outward and away from their head. Depending on size, cobras can shoot their venom 4 to 8 feet. It's an instinctive response that even newly hatched cobras can do.